In this series of extracts from his forthcoming book, Mike Lewis looks at the growth and evolution of social motorcycling in Britain and the USA. From May 1964 and 59 Club members congregate in Trafalgar Square, to collect posters promoting Christian Aid Week, which they then distributed. 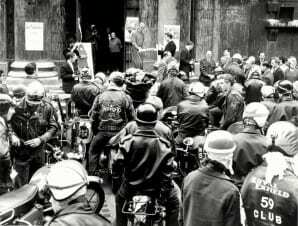 Yet while modernist music and fashions received popular assent from the weekly ITV television programme Ready Steady Go!, there was scant positive publicity for young leather-jacketed motorcyclists, whom the Mods nicknamed Rockers for their conservative musical tastes.